A Pennsylvania preacher, Doug Henry, tells a funny story about a Maryland woman, Edith, who was a mother of eight children. One Saturday afternoon Edith was returning home from visiting a neighbor. As she began to enter the house, she noticed 5 of her youngest children, all huddled together, looking at something that captivated their curiosity. As she quietly tip-toed over to see what was happening, she could hardly believe her eyes. In the middle of the circle were several baby skunks. “Run, children, run,” she screamed at the top of her voice. Quickly each one of the kids grabbed a skunk and began to run. As you can imagine, Edith’s alarm and panic only exacerbated the situation. Her over reaction resulted in a stinky mess. Jesus knew the potential for relational conflicts when he issued this command that will solve so many relationship conflicts. The word “sin” in the text means “to miss the mark.” Thayer says it may be a sin of “thought, feeling, speech or action.” It may be a sin of omission or commission. It may be intentional or unintentional. Whatever the case, it was hurtful. It caused pain. And it was something that personally impacted another brother. What do we do in such cases? The command is simple, yet it seems one of the most difficult within the Family of God. Jesus’ outlines 3 simple steps. (1) Go. The one sinned against is to go to the offender. Yet, too often people go to everyone else–the preachers, the elders, their best friend, or anyone who will listen. A personal offense needs to be handled privately. Also I’ve heard of people who waited for the offender to come to them. “I’m not going,” they stubbornly proclaim. “He did wrong. Let him come to me.” Yet, Jesus says just the opposite. You are the one that should go. Furthermore, the text says, “Go.” Don’t write a letter. Don’t send an email. Don’t text a message. And don’t call on the phone. “Go.” None of the above express your emotion. Display your facial expression. Demonstrate your body language. Or reveal your tone of voice. (2) Go alone. This divine directive is also often ignored. It’s awkward and uncomfortable to deal with conflict, and admit the hurt. So, 1 or 2 people are taken to confront the sinner. This is getting “the cart before the horse.” Taking others should only occur after we make a private, personal attempt to rectify the wrong. (3) Tell him his fault. This seems obvious, yet I’ve seen it ignored. Once a fellow came to me asking advice about how to handle a wrong against him by another brother. I read this passage. And explained it. Later, I asked how the meeting went. He replied that the brother won’t admit his wrong or repent. After several questions trying to pry out of him what was said. I was dumbfounded when the brother told me that he never mentioned the wrong. You’ve got to tell the brother what his wrong is. Maybe he’s not even aware of it. Furthermore, we tell him by practicing “the golden rule.” Be kind. Be gentle. And speak softly. 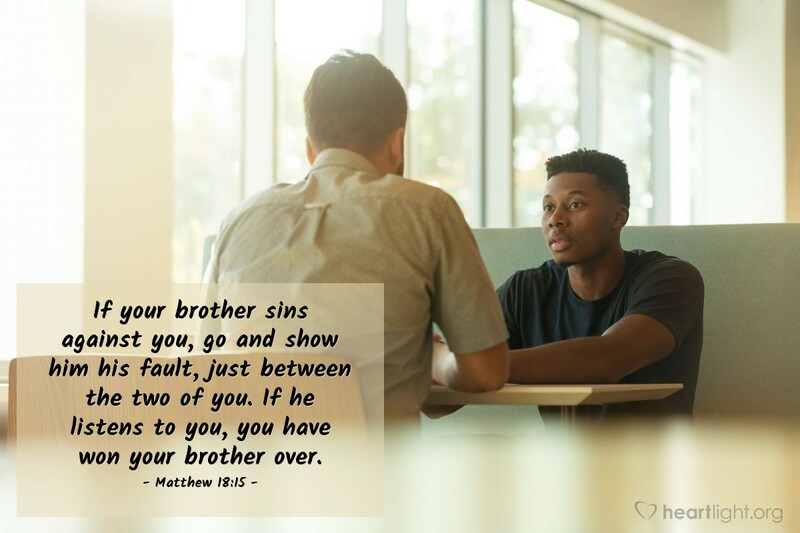 Finally, remember the goal is to “gain your brother.” To repair the relationship. To restore fellowship. And to rescue him from sin. Let’s value our relationship enough to do the difficult thing. The rewards will bless both brothers in both time and in eternity. “Finally, remember the goal is to “gain your brother.” To repair the relationship. To restore fellowship. And to rescue him from sin.” – Amen and amen!